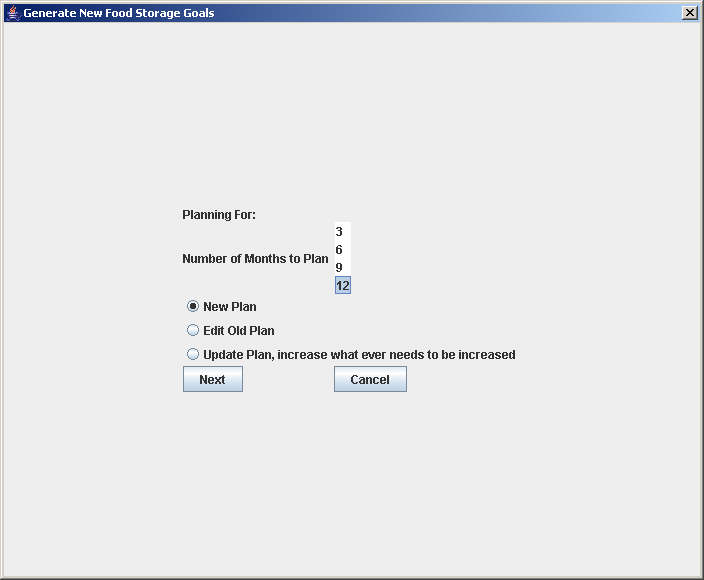 FoodThinger is a free software program for creating and maintaining a food storage plan. Having an emergency supply of food provides peace of mind during times of unemployment or disaster. Using FoodThinger, you can create food storage goals based on your family's needs then track your progress towards your goals. FoodThinger is free and licensed under the GPL. 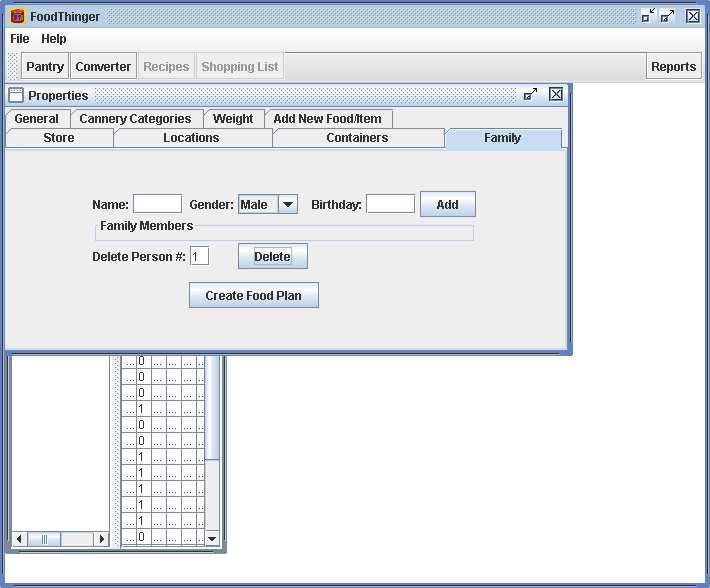 FoodThinger allows you to create an updatable food storage plan based on your family's size (based on information available from lds.org). FoodThinger allows you to add foods as you purchase them and record where you put them. FoodThinger will also keep track of expiration dates for you and allow you to see what foods have expired or will expire soon so you can use them soonest. Food Thinger contains expiration times for the most common food storage foods. FoodThinger uses the USDA's database of thousands of foods. Export your information into a spreadsheet. (This means if you ever want to stop using FoodThinger, you don't loose all the information you've input). See how much of each food you need to purchase. Caveat: I have done my best to ensure the information in this program is accurate, but I am only human. If you feel an amount FoodThinger recommends is too small, please buy more. Enter your family member's name by typing their name in the box labeled "names", choose their gender from the drop down box, and enter his/her birthday in the box (MM/DD/YYYY). Then click on the "Add" button. His or her name will appear in the "Family Members" box. To remove a family member from the plan, type the id number of the person in the box "Delete #". Then click the "Delete" button. When you are finished adding family members, click on the "Create Food Plan" button. Select the number of months you want to plan for by selecting the number of months in the "Number of Months to Plan" box. Then select the "New Plan" option. Click "Next". The "Plan Amounts'" area shows the types and amounts of foods in the plan. To change an amount, click in the "User Amount" column of the food you want to change, then start typing. The "Summary" area shows you a quick summary of how much of each food is suggested and how much you currently have as your goal. It will turn a category red if you have less than the recommended amount in any category. If you want to add a food, use the "Add an Item" area. Select the food you want, what category it is in and select a name for a subcategory. You can also enter how much you want. Click the "Add" button. The food will be added to the "Plan Amounts" table. Once you have your plan as you like it, click the "Finish" button. You will be taken back to the "Properties" window. You can now close this window by clicking on the "X". If you later need to add a new family member, go to File->Properties->Family, add the family member then select the "Generate Food Plan" button and go through the steps outlined above. In the main FoodThinger window, click on the "Pantry" button. This will bring up the pantry window. Click on the "Add" button.. This will bring up the "Add an Item to the Pantry" window. Enter the number of containers you bought. Select the expiration date for the food. When you are finished adding foods click on the "Cancel" button or on the "x" in the corner of the "Add an Item to the Pantry" window. FoodThinger provides several ways to check your food storage progress. Click on the "Reports" button. If you want to view your reports in a spreadsheet or other program, you can export the information by clicking Export ->Export. The information in the current (visible) tab will be exported. The image below shows the export window for the "Totals" tabs. 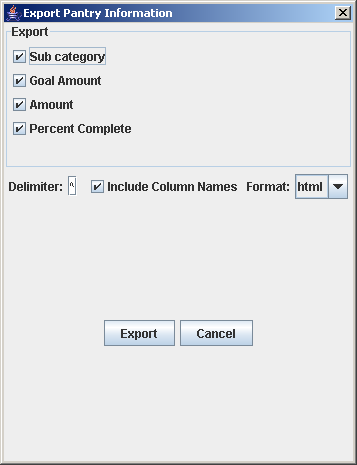 Select which of the columns of the table you want to export. Choose your delimiter (the symbol that will be put in between the columns. A comma is a bad choice since many food names contain them). You only need a delimiter if you are exporting as a csv file. Decide if you want the names of the columns included. Choose your format: html or csv. Html is the format for a webpage that you can look at in your web browser and print it. 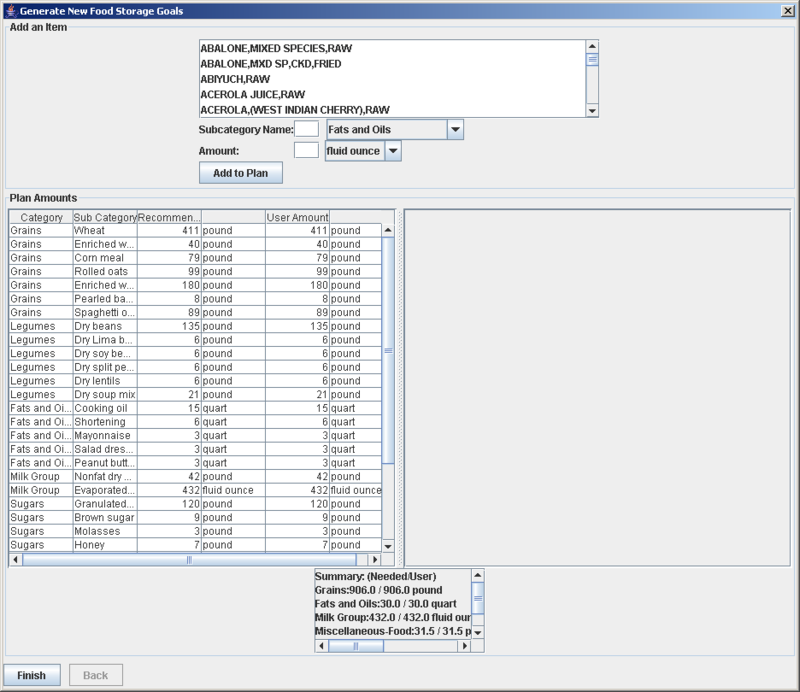 Csv is the format to look at in Excel or other spreadsheet program. Click the "Export" button. Enter what you want the file to be named then click "Save". Click on the "Pantry" button. This will bring up the pantry window. On the left side shows the categories of food (Fats and Oils, Fruit, etc.). The numbers in parentheses are how many of each item you have in each category. If you select a category by clicking on it, you can see the food items just in that category. If you click on the little circle next to the file folder icon, you can see the subcategories and how many foods are in each one. The right side shows information about the food stored. It shows the id number of each food, if the food has passed its expiration date (1 means yes, 0 means no), the food name, its container, the expiration date, purchase date, location, how many you have, the store, the price and the weight. If you click on one of the column headings, this sorts the list by that column. If you click on the column heading again, it sorts the list the other way. You can also resize the columns. See Adding a food above. Once you have eaten a food in your pantry, you will want to remove it. You can either delete it as described above, or you can "Decrement by One". For example, suppose you added three cans of wheat, so there is 1 row in the pantry that represents 3 cans of wheat. 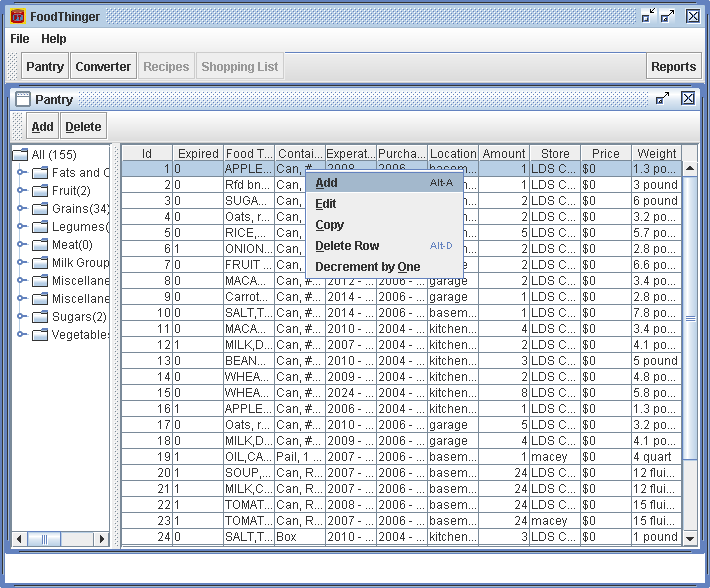 When you eat one of the cans, select the the row in the pantry, right click and bring up the menu, then select "Decrement by One". This will change the row to show 2 cans of wheat. Sometimes you have a food that you want to add again exactly as it is already in the pantry. Select the row in the pantry by clicking on it. Right click to bring up the menu. Select "Copy". A copy of the food will appear in the pantry. You can edit the information in a pantry row. Select the food you want to edit by clicking on the row. Right click to bring up the menu. Select "Edit". A window exactly like the "Add a Food" window will appear. Make your changes and click the "Update" button. To get to the Properties window, select File->Preferences. The "General" tab has one check box, "Treat expired items as still usable". Check this box if you want items considered expired to still be included in your report totals. The Store, Locations, and Containers tabs all work the same way. The instructions below are for the "Store" tab, but you would do the same thing for any of the tabs. To add a new store, click in the text box and type the name of the store. Click the "<-Add" button. To rename a store, from the drop down box select the name of the store you want to change. Click in the text box and type the name of the store. Click the "<-Rename" button. This will change the name of the store everywhere it occurs. 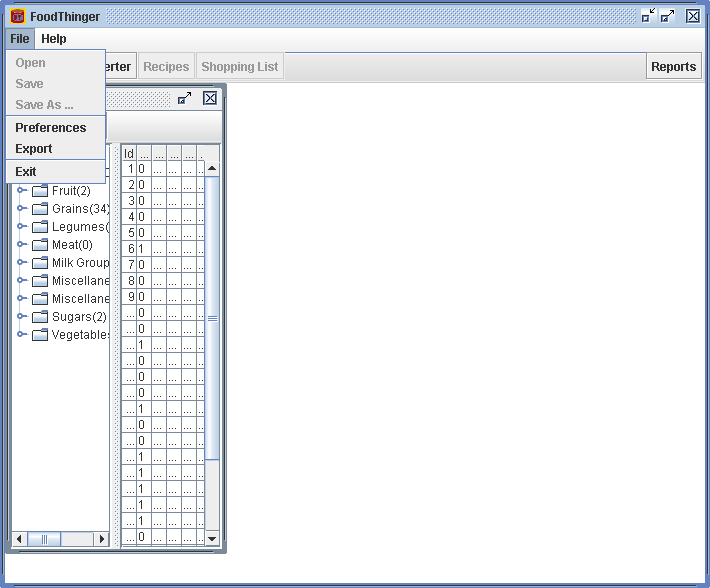 To delete a store, from the drop down box select the name of the store. Click on the "Delete" button. Note: you cannot delete the name of a store if a food in your pantry uses it. See the description under getting started. Click in the "Food/Item Name" box and enter the food's name. Click in the Common Name box and type a common name for you food (if desired). Choose a category for your new food. In the weights area, you can enter how much an item weighs. You can enter several different weights for example, how much it weighs in a #10 can and how much it weighs in a 5 gallon bucket. Click the Add button. This information will be available in a later version. You may wish to export your pantry to another program. Go to File->Export. The "Export Pantry Information' window will open. From the Export area of the window, check the boxes for the information you want exported. 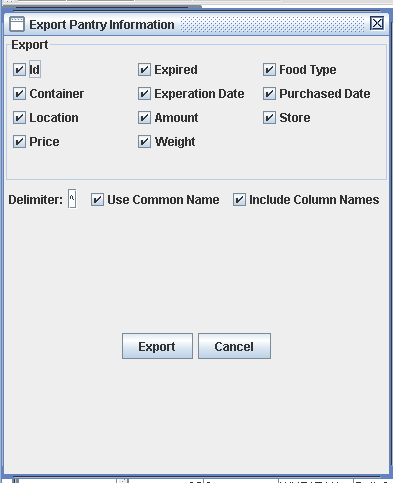 Choose a delimiter (a delimiter is a symbol that will show the divisions between different columns. Do not choose a comma because commas are used in food names). If you want the common name for the food to be used, check the "Use Common Name" box. If you want the column names included, check "Include Column Names". 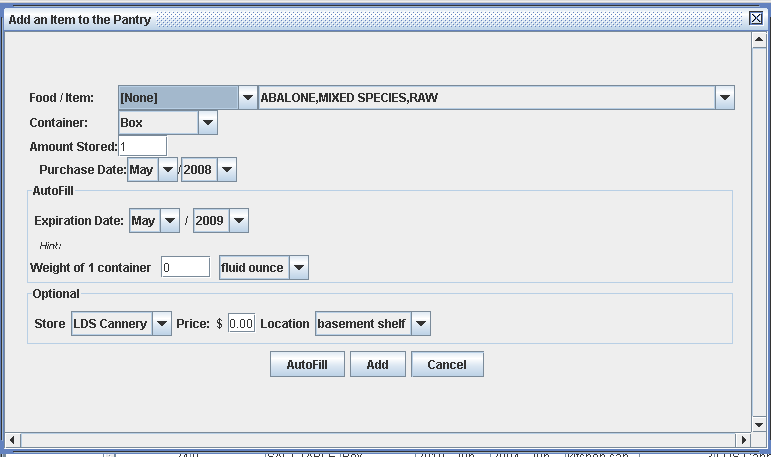 You might not want the column names if you are importing the information into another database. Click the "Export" button. A save file window will appear. 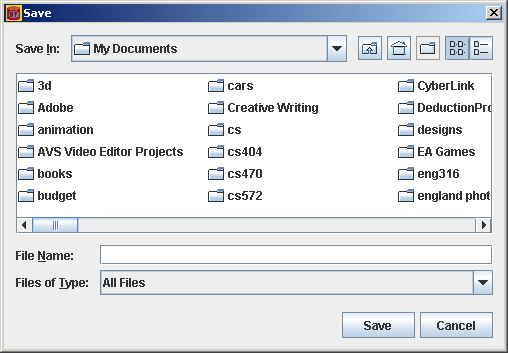 Type the name of the file in "File Name" and click the "Save" button. The converter allows you to convert between different measurements. Click the "Converter" button. The "Convert Units" window will open. Click in the text box and enter the number you want to convert. Select from the first drop down box the units the number is in. 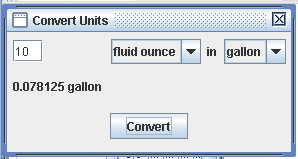 In the second drop down box, select the units you want the amount to be in. Click the "Convert" button. The converted amount will be displayed above the convert button. There is a known issue with some video drivers not updating FoodThinger's windows correctly. In English, this means when you scroll through your pantry, the text will get blurry. Updating your video driver will fix the problem. Chart2D - Java chart drawing program. Released under the GPL. This software is copyrighted by Christian Werner . The following terms apply to all files associated with the software unless explicitly disclaimed in individual files. The authors hereby grant permission to use, copy, modify, distribute, and license this software and its documentation for any purpose, provided that existing copyright notices are retained in all copies and that this notice is included verbatim in any distributions. No written agreement, license, or royalty fee is required for any of the authorized uses. Modifications to this software may be copyrighted by their authors and need not follow the licensing terms described here, provided that the new terms are clearly indicated on the first page of each file where they apply. IN NO EVENT SHALL THE AUTHORS OR DISTRIBUTORS BE LIABLE TO ANY PARTY FOR DIRECT, INDIRECT, SPECIAL, INCIDENTAL, OR CONSEQUENTIAL DAMAGES ARISING OUT OF THE USE OF THIS SOFTWARE, ITS DOCUMENTATION, OR ANY DERIVATIVES THEREOF, EVEN IF THE AUTHORS HAVE BEEN ADVISED OF THE POSSIBILITY OF SUCH DAMAGE. THE AUTHORS AND DISTRIBUTORS SPECIFICALLY DISCLAIM ANY WARRANTIES, INCLUDING, BUT NOT LIMITED TO, THE IMPLIED WARRANTIES OF MERCHANTABILITY, FITNESS FOR A PARTICULAR PURPOSE, AND NON-INFRINGEMENT. THIS SOFTWARE IS PROVIDED ON AN "AS IS" BASIS, AND THE AUTHORS AND DISTRIBUTORS HAVE NO OBLIGATION TO PROVIDE MAINTENANCE, SUPPORT, UPDATES, ENHANCEMENTS, OR MODIFICATIONS.